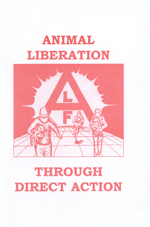 Animal Liberation Through Direct Action was one of the better primers available in the 1990s. 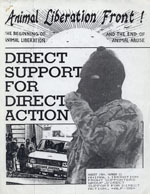 Designed for activists who had never before participated in illegal actions, the pamphlet discusses the basic security, surveillance, and planning necessary to carry out liberations and economic sabotage. 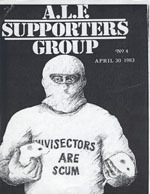 It also includes a brief history of the movement, a first hand account of a mink farm raid, and statements from various ALF cells. 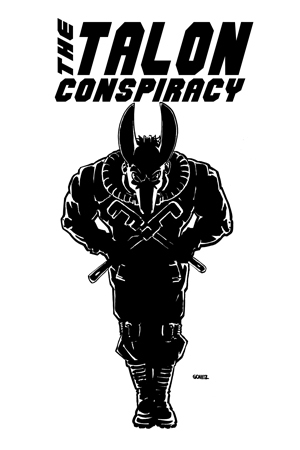 While I am not the biggest fan of “vegan straight edge” publications, XUltraMilitanceX manages to fit a few positive aspects into it’s otherwise formulaic, religiously worded format. 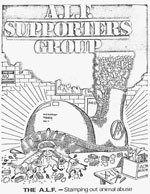 Between the band interviews, sobriety cheerleading, and calls to “destroy Babylon,” there are some good articles on the history of the movement and a slightly deeper analysis of capitalism, the state, and human supremacy than I would expect from a zine named after an Earth Crisis song. 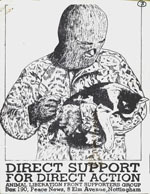 Produced by a former anti-HLS prisoner, this was also one of the few XVX zines written by someone willing to actually act on the lyrics and liner notes that inspired them to begin with. 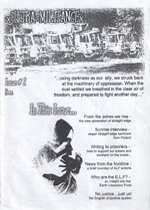 Issue #2 and #6 are very rare and took us a few years to find, but they complete our collection of this popular zine. The other issues can be found HERE. 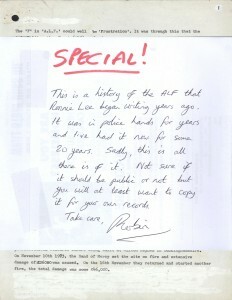 The raw stuff of history: An incomplete, unfinished Ronnie Lee manuscript. 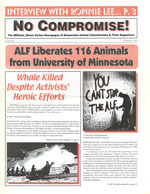 A few months ago we contacted our friend Robin Webb to borrow some of his animal liberation publications for scanning. 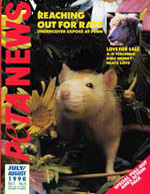 Robin cheerily agreed to send us a package, and when it arrived it included some of the rarest publications we have yet received. 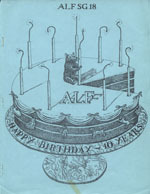 We gingerly pulled one gem after another from the box, and just when we thought we couldn’t be more excited we found this unfinished history of the ALF written by Ronnie Lee. 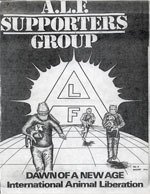 Drafted almost thirty years ago, this publication spent decades in police custody before ending up in the possession of the ALF Press Office. After its trip through the evidence room the manuscript is missing over a hundred pages, but still bristles with history. 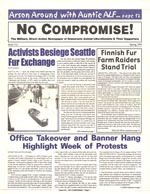 We are still investigating the story behind this document, but felt it would be unfair to our readers to keep it out of circulation any longer. 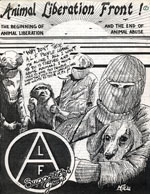 Here, distributed to the public for the first time, is the story of the Animal Liberation Front as told by one its founders. 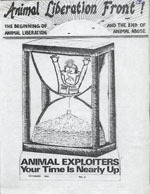 People for the Ethical Treatment of Animals experienced a meteoric rise in membership and notoriety in the early 1980’s as a direct result of their support for (and participation in) illegal direct action. 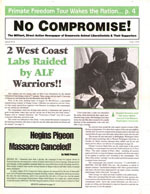 Their relationship with the Animal Liberation Front was symbiotic: PETA provided the ALF with whistlebower information, credible spokespeople, and sympathetic coverage of raids. 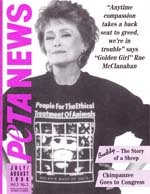 In return, PETA was placed in the media spotlight and received undercover footage and documents from the ALF that were often parlayed into high profile (and lucrative) campaigns. 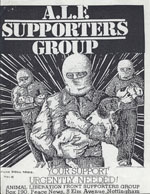 The atmosphere of popular militancy was exciting, and after years of slow progress people felt that supporting PETA meant backing a faster, more direct path to rights for non-humans. 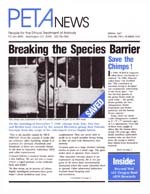 PETA sold ALF support merchandise in their newsletters, ran a legal defense fund for people accused of unlawful activism, and helped popularize the concept of mischief in defense of animals. 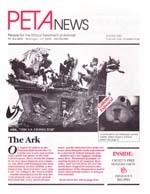 For example, PETA News sold squirt bottles of red permanent fabric ink alongside the warning that since the damage done to furs would be permanent, you should only spray the ink on your own furs! Articles talked about a likely apocryphal 15 year old who got grounded for passing out “Throw a Brick Through McDonald’s Day” pamphlets, and later chuckled as he got caught with paint bombs under his bed. 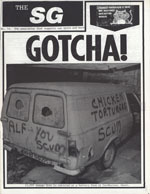 Incidentally, the same article described how young “Kevin” made the paint bombs. 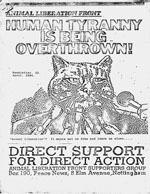 These examples only just barely scratch the surface of the early militancy of Alex Pacheco and Ingrid Newkirk’s fledgling organization. 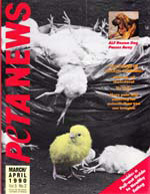 The story of animal rights in the United States can not be told without a thorough examination of the early days of PETA, an era sure to shock newcomers. 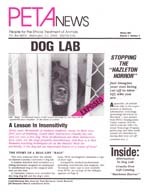 In the coming months we will begin a more in depth analysis of their early days, but in the meantime jump into the TALON time machine and prepare to have your mind blown by these early issues of PeTA News. It is not usually our habit to put up a single issue of a serialized publication as we prefer to post an entire year, or run of magazines, in a single post. 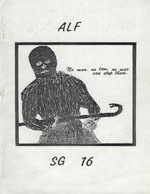 However, we must make an exception for the ALF SG Newsletter #17, which contains a fantastic investigation of the Band of Mercy and comes complete with an image of their first press statement from November of 1973. 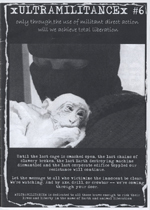 The significance of that image, the very first communique from an underground group fighting on behalf of other species, can not be understated. 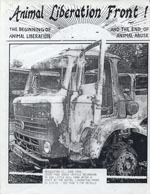 When one considers how entrenched animal exploitation is in our culture, the idea that a tiny band of revolutionaries could push back against that social tide by burning down an animal laboratory under construction is a watershed moment. 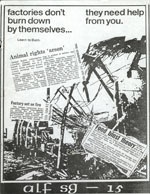 The arson attacks and raids carried out by the Band of Mercy were pivotal in the creation of the animal rights movement. 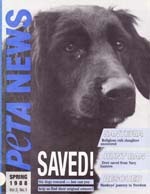 This issue has much more in store for readers. 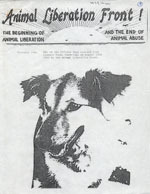 The second communique from the Animal Rights Militia is presented in it’s entirety, and although it provides a myopic examination of the role of liberatory violence it is none the less a fascinating read for lovers of animal rights history. 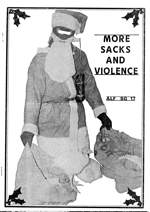 The story of the famous Ecclesfield Beagle raid is presented by one of it’s participants, Roger Yates has a long letter explaining his feelings on the uselessness of national groups, and funny pseudonyms abound! If you thought Earth First!ers had funny names, wait till you get a load of Captain Kirk, Martial Rose, and Black Vixen! 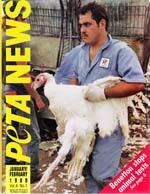 If you look carefully you may notice that this issue is missing some pages. 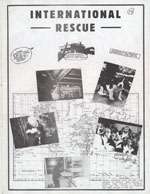 We do not know if this is because they were removed by their original owner, or if this is one of the issues of the SG rumored to have been “edited” by the British government as it left post offices on it’s way to subscribers. 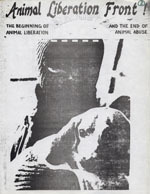 Based upon a television show of the same name, Animal Warfare was one of the first books written about the rise of animal liberation militancy. 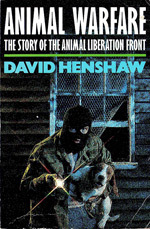 Its author, David Henshaw, is decidedly anti-animal rights, and at times his coverage is so unfair and deceitful that it’s tempting to write this publication off as mere tabloid journalism. That would be a mistake. While clearly written from the perspective of a person intent on smearing activists, this paperback also provides us with a look at our history less slanted by movement propagandizing and cheerleading. At times that picture is not pretty. 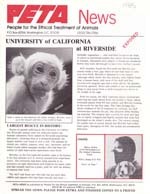 Authored during the rise of what some English activists called “the cult of militancy,” Animal Warfare takes the fodder provided by the most extreme actions of the early 80s and spins an ugly tale of car-bombs, poisoning hoaxes, graveyard desecration, and alliances with racist organizations such as the National Front. While there are plenty of grotesque distortions of facts, there are also valuable lessons to be learned about how the best tactical decisions consider our movement’s ability to survive backlash while building mass. 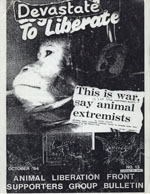 At a time when many modern activists seem intent on repeating the mistakes of the past, (or at least blogging as if they intend on repeating those mistakes), Animal Warfare contributes to our ability to learn about media falsification, the dangers of militaristic posturing, and the events which led to the weakening of England’s mass militant movement for animal liberation.